Before we get started, I just want to say thank you for how much support I have received since my blog reboot last week! I had a new post up every day of the bank holiday weekend and received so many lovely comments/messages from the blogging community. THANK YOU! It really means the world to me. Leading on from last week, you might have seen my bullet journal post, and how I think it’s changed my life. Leading on from that, today I wanted to show you my spreads/layouts for this month. 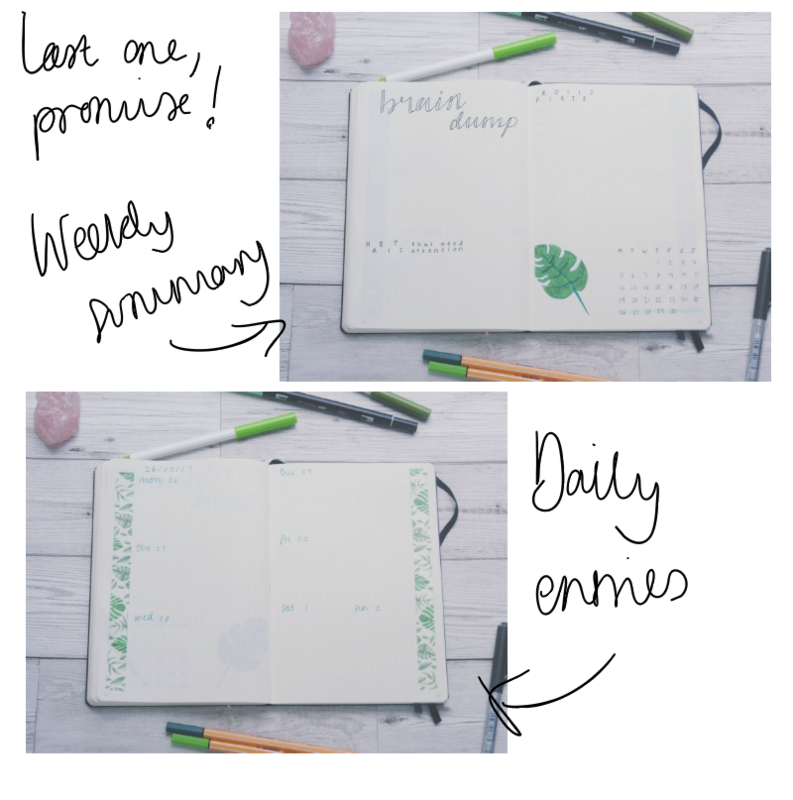 This will be the second post in my bullet journal series! Whenever I start a new month, I always make sure I draw up the following pages straight away, as they’re the most important to me. These monthly logs & collections are vital to me if I’m going to have a good month. This month, as you can see, I’ve gone for a bit of a tropical, palm leaf theme. I bought some tropical washi tape ages ago and decided since it was June and the weather should be good (although I live in England so who knows!) I’d go all out and have a consistent theme. This is the first time in my bullet journal that I’ve stuck with a theme the whole way through. Usually, I like to mix it up. So we’ll see if I love or hate this idea by the end of the month! In my monthly log, I always have a full calendar so I can visualise when everything is that I’ve got planned. I also like this because if it’s empty, it encourages me to plan some fun things to do! I also have three sections surrounding the calendar, Monthly Goals, Events, and Tasks. I like to set myself three main goals per month to work towards. This month that’s probably going to consist of lots of health/self-care goals. I’ve got a holiday in July I want to be feeling my best for! I keep the events section to jot down exciting things that are happening that month. Yes, they’ll also be on the calendar, but I live for hype, so hyping them up more is only a good thing in my eyes. The Tasks section is, literally just that, tasks I need to get done that month. Top of my list this month will be to sort out my wardrobe. I like having this section on my monthly log, because it keeps them in my mind, even if those tasks don’t have a specific date they need to be done by. Onto my habit tracker! 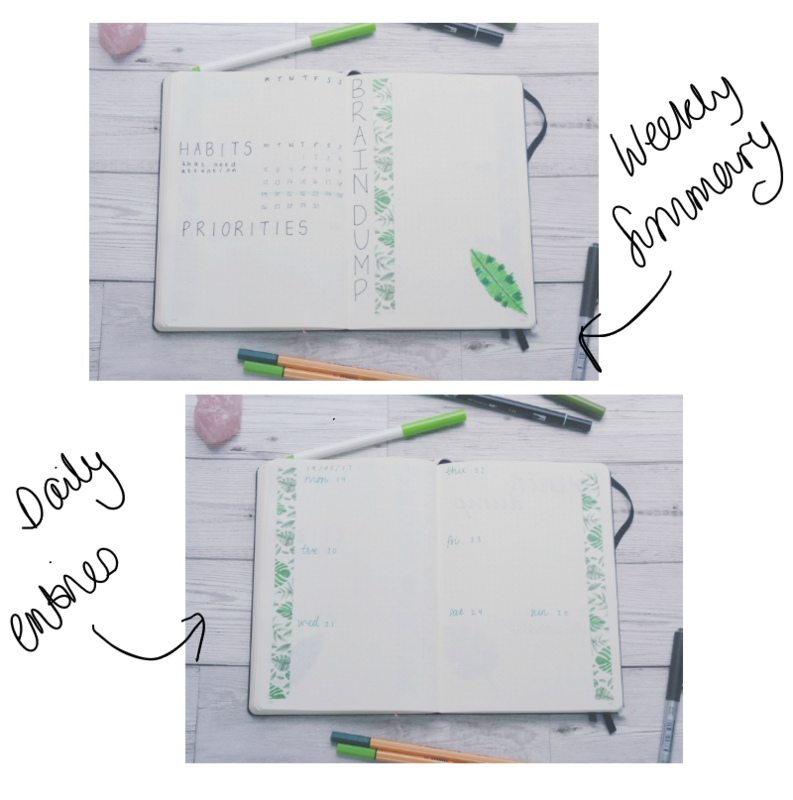 As I said in my last bujo post, I love habit trackers. I think it’s such a window into what makes you happy and I think it’s a good signifier of when things might be slipping, and hopefully, means I’ll be able to spot this and do something about it. For example, last month at the beginning I was working out… somewhat (better than nothing!) and by the end of the month, this had completely stopped. It’s good for identifying situations like that. I also like to track my mood on the same page as my habit tracker. Again, it links into seeing when things are going down hill. Chances are, the better my mood, the more things I’ll have ticked off on my habit tracker above! I like to do a dot for my mood, and colour in the square on my habit tracker. I feel like people have a love-hate relationship with brain dump pages. Some people use them religiously, some people don’t see the need for one. I have become reliant on mine. I like to jot everything here. Podcasts I want to listen to, ideas for new collections, things I need to get done, mini wishlists, quotes, doodling. 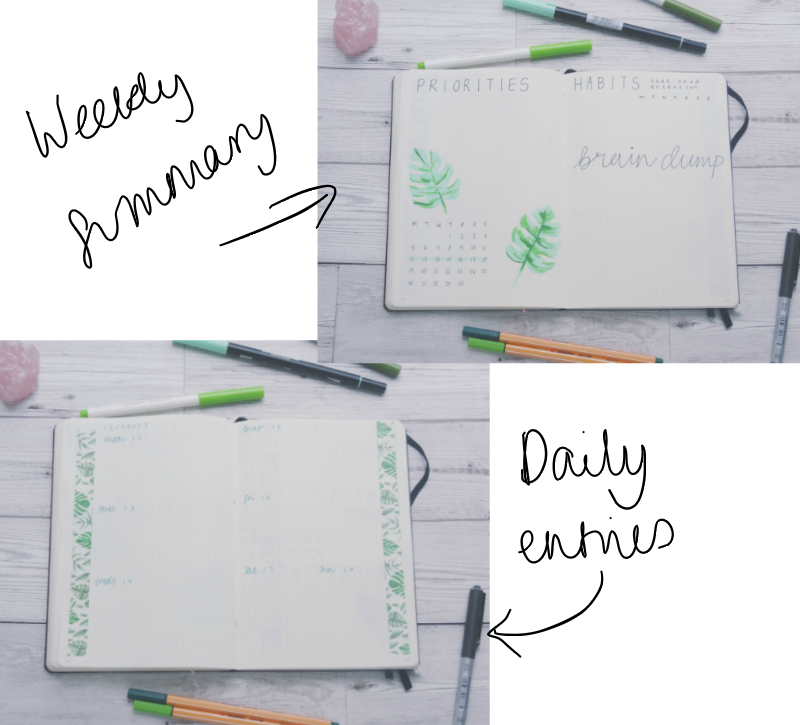 Last month I actually filled my brain dump in the first two weeks, so this month I’m adding a brain dump area for each week. Read on to see how! I’ve been tracking my social stats in my bullet journal for the last 3 months now. I do it at the start of the month and will jot down the platform and no. of followers. I’m not particularly bothered about this but I want to track any changes, especially at the moment following my blog reboot! Remember me saying that this month I’m going to be focusing on exercising more? Yeah. This page is to hopefully encourage me to do that more. I’m planning on writing down my stats for any runs I complete and jot down what I do in the gym so I can come up with more of a routine for myself. We’ll see how well this works though…! I would highly recommend everyone has a deliveries page! Don’t worry, I won’t fill this whole page up in just a month! On this page I like to jot down anything I’m ordering online, the date I placed the order, where it’s from, and then I can tick it off when it arrives! There’s nothing worse than getting one of those “Sorry we missed you” leaflets through the door, and not being able to remember what you ordered! It also means you can chase up any orders which haven’t arrived by the time they should have! In order to organise my wardrobe this month, I’ve decided to have an outfits page. From now on, every time I wear an outfit where I feel super confident and on top of the world, I’m going to sketch (attempt to, anyway!) a rough drawing of that outfit. I think this will help in two ways. Firstly, if I ever don’t know what to wear, I can just flick to this page and get some inspiration - from my own wardrobe! And secondly, it should help me figure out which clothes I really love, and which I don’t. Making it easy to say goodbye to those ones, and clear up my wardrobe! Now for the weekly & daily logs. This month I’m trying out something a little different. Usually, I just dedicate space for each day of the week and be done with it. But I’ve found I need a bit more a nudge to get things done. I also wanted more space to write notes and keep on top of goals, that didn’t fit on my old weekly log. So now, I have dedicated a sort of summary page I guess, to jot down what my priorities are that week, habits that need attention, and a brain dump area, for extra notes/doodles, you name it. The idea behind this, is that I can use my monthly habit tracker to keep track of how things are going, and at the start of each week if I notice one is lagging behind e.g. meditation, I can make that a ‘habit that needs attention’ for a week, and hopefully get things back on track! That’s the plan! Below you can see the variations of this summary page throughout June. So that sums up my June spreads so far! As the month goes on, I will be adding any pages that come to mind that I think will come in handy. I’m seeing a lot of shows this month so I might try and dedicate a few pages to stick tickets, as a little momentum page. 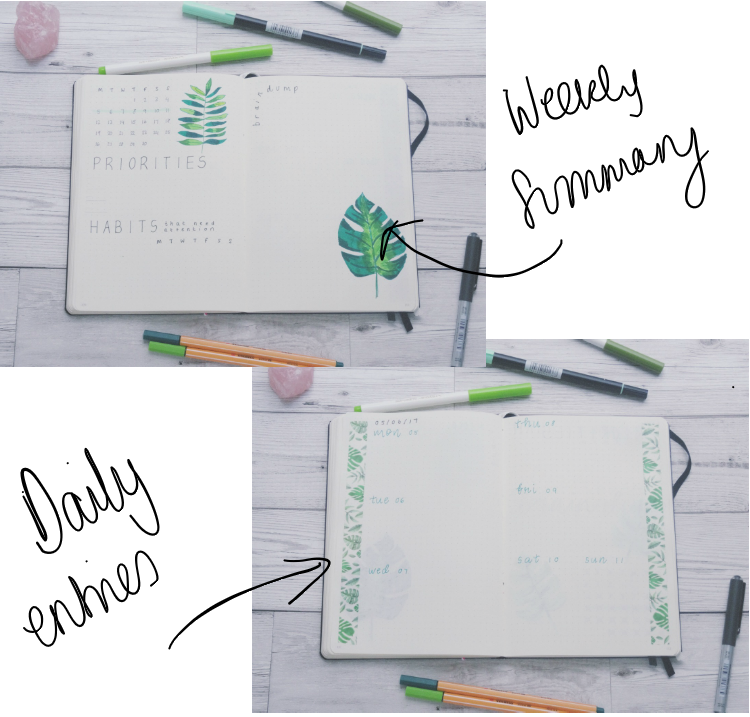 If you’re a bullet journal user, what pages to you always draw up at the start of each month?